Present state: Demolished, the approach road remains but there is no apparent evidence of the station. The goods shed is still sanding and is used by a stonemason. Notes: Alne station opened in 1841, when the Easingwold Railway opened in 1891 a bay platform was provided at the northern end of the 'up' platform at Alne. A water column was located on the platform, but this was removed during the 1930's. 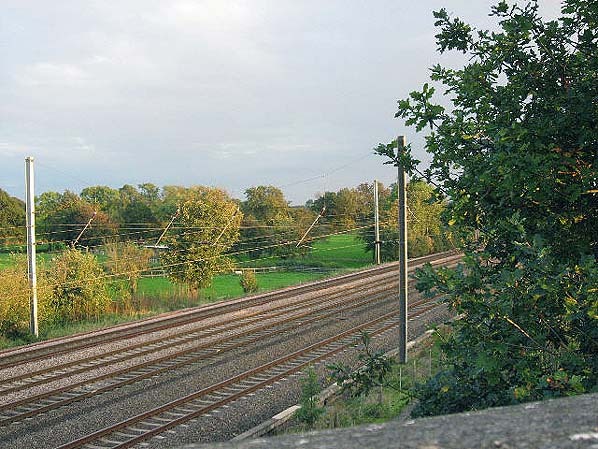 The Easingwold's Alne Junction also included a passing loop and long siding. The NER had a small goods yard on the opposite side of Alne Station. A crossover allowed Easingwold locomotives to reach this yard, although the crossover was moved during a re-modeling in the 1930's. Alne closed to passengers on 5th May 1958 a few month before complete closure of the Easingwold line. 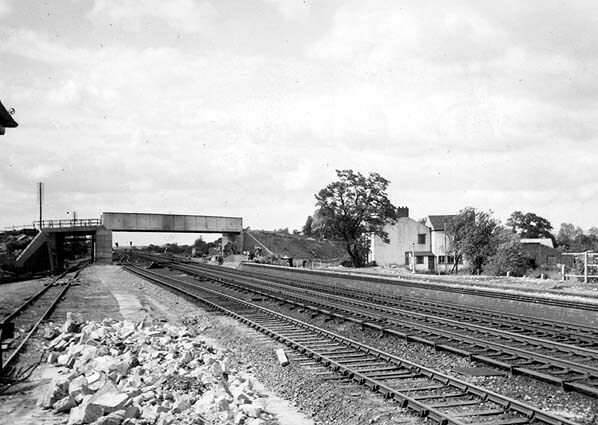 The station remained open for freight traffic until 10th August 1964 and the site was cleared during modernisation of the main line. Orders in 1896, 1912 and 1921, all of which were granted. The station had a single platform with a small timber building; there was also an extensive goods yard comprising four sidings, passing loop, goods sheds, weighbridge, weigh office, coal drops, cattle dock and an engine shed large enough for the one loco owned by the company but no large enough for the locos later hired from the LNER and BR! During the early years of the20th century, the line was never a great financial success but was just able to cover running costs but this wasn't sufficient to pay a dividend. Gradually this situation improved and by 1910, company accounts show a clear profit of £767 and a dividend of 4% was paid with 3-4% being paid annually for a number of years. two drivers, one fireman, one guard, and two permanent way men. only a 1% dividend being paid in 1931. Freight revenue improved during WW2 when it carried thousands of tons of war materials to be handled in the station yard until it was pointed out that it was unsafe to carry heavy loads of munitions over the old track with the risk of derailment and consequent explosion. In 1944 the new source of income from war supplies was ploughed back into the company by relaying the track with second-hand L.N.E.R. materials. The company was criticised at the time for not paying a dividend while the line was in profit. £18. Of these, only 231 passengers originated on the company’s system. The branch was clearly an early candidate for closure and passenger services were withdrawn on 29th November 1948, but the station remained open for freight with two freight trains every weekday except Saturday, when there is only one. On Friday, 28th September 28 1951, the Easingwold Railway ran a special train for the York Miniature Railway Society, the first passengers to use the line since closure 1948, a number of enthusiasts specials used the line through the 1950's. survived until 1967 when it was destroyed by fire leaving only the Station Hotel standing. The site of the station has now been redeveloped as a road and housing. however, normally consigned through to its final destinations. The line was often referred to as England’s shortest standard gauge passenger railway at just 2 1/2 miles in length. Easingwold Council has retained a small stretch of the branch line between Drovers Court and Station Court as a park. 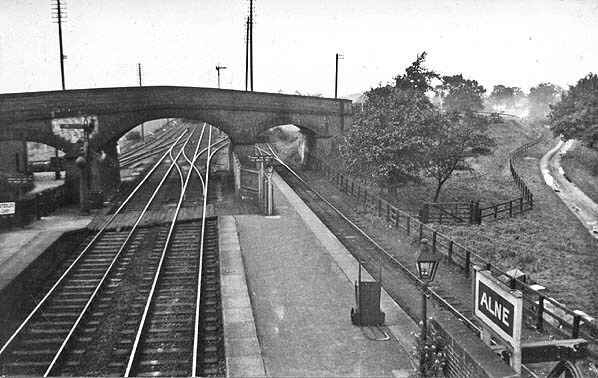 The Easingwold bay platform at Alne Station in early 20th century. Note the crossover under the bridge to allow Easingwold locomotives to reach the goods yard which can be seen on the left.